Her real name is Nicole, but everyone calls her Niky. She's gorgeous. She has a great figure. She's talented as hell. She's a tremendous cook. A capable and loving mother and wife. Intelligent and friendly. O.K., I got all that out of the way. Now I can tell you about Niky, the person. 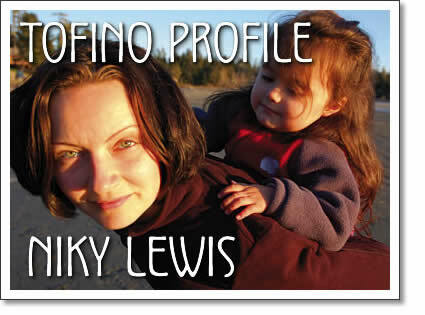 Like most young people living in Tofino, she's not from here. Born in Winnipeg, her family moved to Toronto when she was nine. She and her sister were raised by their really cool mom, called P.J. Niky's life is about performance arts: music and dance. There was a brief time in high school when she thought she'd really like to be a lawyer. She imagined herself in the center of courtroom dramas, so she diligently studied law and Latin. For Niky, being a lawyer was an act of rebellion, since her mother managed punk rock bands. Then coursework required her to spend hours in court, observing. While the hours ticked away, bored by the actual dullness of courtroom proceedings, Niky decided she wanted a career on stage. She had been playing trombone since age twelve, so auditioned and won a place in ubc's Orchestral Performance program. Niky says she loved being in the back row, "one of the boys" playing in the low brass section, though she says the guys were "crass". First year was mostly classical training; the second year was jazz. Niky played lead trombone in the ubc jazz band for three years. Throughout those years of study, she gigged in Vancouver in pit orchestras playing musical comedy: Oklahoma, The Music man, Hair, to name a few. Though she loves playing the trombone, Niky tells me some stuff about being a trombone player. It seems there are not a lot of parts written for trombone. A trombone player spends a lot of time in the orchestra counting "rests" until it's their turn to play. Trombone players don't get a lot of gigs. She tells me a joke to illustrate. "What's the difference between a dead trombone player on the road, and a dead frog on the road?" Answer: The frog was on its way to a gig. During music history classes in her first year, the prof put Balinese gamelan music on the ghetto blaster. "It had a foreign, eerie sound that I loved immediately," says Niky. "ubc had a gamelan group, but I couldn't fit it into my schedule until my fourth year, but I attended all the gamelan concerts." Gamelan is three things: a type of music, the instrument itself, and the ensemble of players. Fifteen of the instruments are bronze or brass metalophones, percussive instruments like xylophones. They sit on wooden frames with bamboo resonators inside. Then there are gongs and variations of gongs, two two-sided drums, and sometimes bamboo flutes, cymbals or a stringed instrument. Niky describes herself as "hooked" on gamelan. After graduating, she spent five months in Bali studying gamelan two hours daily. Until recently, women didn't play gamelan. Now there are many all female orchestras, but still no co-ed groups. Attending arts performances every night, Niky became fascinated with traditional Balinese dance; one dance in particular called Teruna Jaya (Victorious Youth). This dance is always danced by a woman, but is unusual in that the character is neither male nor female, but androgynous. The stronger, more rhythmic movements of this dance differ from the softer, slower classical female movements. Niky learned the choreography from her gamelan teacher's sister, whose specialty is this particular dance. Those of you who attended the dance series at the theatre last year will remember all our jaws dropping to the floor in amazement when Niky appeared fully costumed and made up, and danced Teruna Jaya. The fantastic exotic movements of body parts and eyes left us gasping. How did she do that! People talked about it for days. On a recent trip to Bali, Niky learned Oleg, the Bumblebee Dance, choreographed in the slower, classic female style. Bali's culture has captivated Niky. "The people are peaceful, generous. So many are artists of all kinds, and everything is done esthetically. Beautiful people, wearing beautiful garments, prepare beautiful food and performances--all done to please the gods. Bali and its mix of Buddhism, Hinduism and Animism stands alone in largely Muslim Indonesia. While there is no gamelan orchestra or Balinese dance teachers here, Niky is still deeply involved in show biz. She has coordinated local arts events such as the Storytelling Festival and Dance Series. The Pacific Rim Arts Society (pras) hired her soon after she, husband Diego Garcia and their adorable daughter, Carmencita, arrived in 2003. Working with the very able Marilyn Brewer, she's currently working on preparations for the annual Pacific Rim Summer Festival. "Despite limitations, locals are able to see top-notch talent in current venues," Niky says, "but there are many acts we can't bring in because we wouldn't be able to pay the performers with what we can charge at the box office. Even what we do present couldn't be paid for without significant local contribution and government grants." Niky laments that pras can't bring in professional dance or theatre groups because there are no wings or dressing rooms in the theatre. Naturally, what Niky would eventually like to see in the area is a Center for the Performing Arts, and the arts become a viable economic source for our communities. P.S. If we ask nicely, I think Niky would get her mom to send the trombone to Tofino so that Niky could arrange a jazz concert. Reserve ahead.